384 pages | 184 B/W Illus. This new book explores the consideration of relationships that connect the structural and basic mechanical properties of polymeric mediums within the frameworks of fractal analysis with cluster model representations attraction. Incidentally, the choice of any structural model of medium or their combinations is defined by expediency and further usage convenience only. This book presents leading-edge research in this rapidly changing and evolving field. The book presents descriptions of the main reactions of high-molecular substances within the frameworks of fractal analysis and irreversible aggregation models. Synergetics and percolation theory were also used. In spite of the enormous number of papers dealing with the influence of the medium on the rate of chemical reactions (including synthesis of polymers), no strict quantitative theory capable of "universal" application has been put forward up until now. It is now possible to describe the relationship between the reaction rate constants and the equilibrium constants with the nature of the medium in which the reactions take place by means of a single equation. 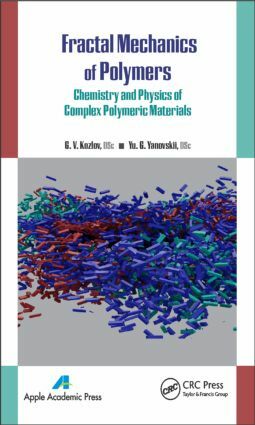 This important book for the first time gives structural and physical grounds of polymers synthesis and curing, and the fractal analysis is used for this purpose. G. V. Kozlov, DSc, is a senior scientist at UNIID of Kabardino-Balkarian State University in Nal'chik, Russia, during 1981-1994 and from 1997 until now. His scientific interests include the structural grounds of properties of polymeric materials of all classes and states, including the physics of polymers, polymer solutions and melts, and composites and nanocomposites. He has proposed to consider polymers as natural nanocomposites. He is the author of more than 1500 scientific publications, including 30 books, published in Russia, Ukraine, Great Britain, German Federal Republic, Holland, and USA. Yurii Grigor'evich Yanovskii, DSc, is director of Institute of Applied Mechanics, Russian Academy of Sciences, Moscow, Russia. He is a specialist in the field of physics and chemistry of polymers, composites, and polymer materials. The majority of his publications are concerned with the mechanical properties of polymers. He is contributor of 1000 original papers as well as many reviews. He has published more than 100 books.